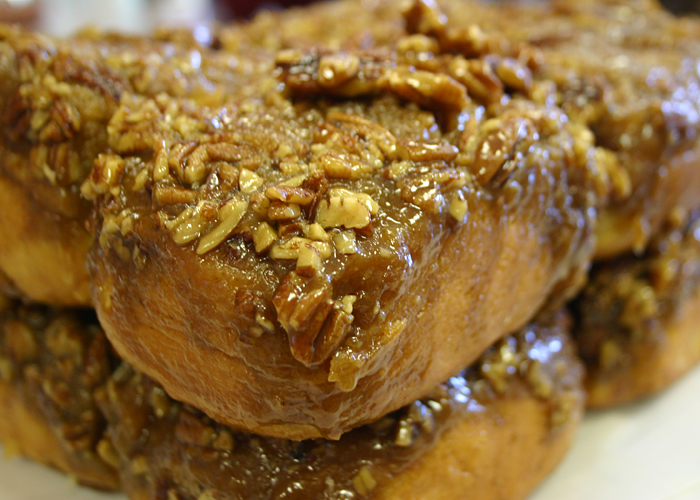 “Sticky Bun Sunday” has such a nice ring to it. Join the happy crowd smacking sticky fingers at this neighborhood treasure in historic Charleston. 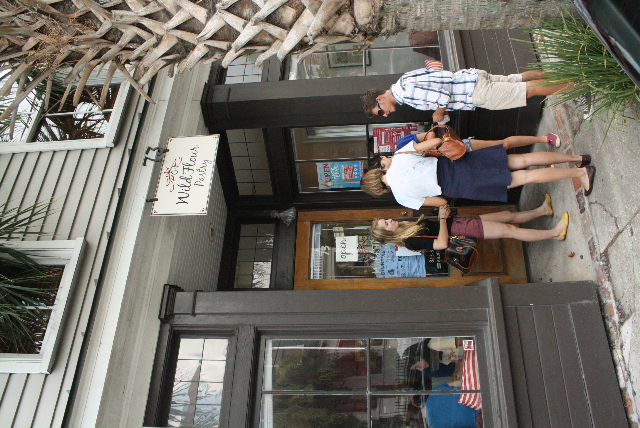 The Sunday morning line at WildFlour Pastry stretches out the door and down Spring Street, but nobody standing in it seems to mind waiting. In chatty groups or as cuddly pairs or alone, people laugh and talk or read newspapers or thumb iPhone keypads in the shade of breeze-ruffled palmetto trees as they anticipate the treat ahead. 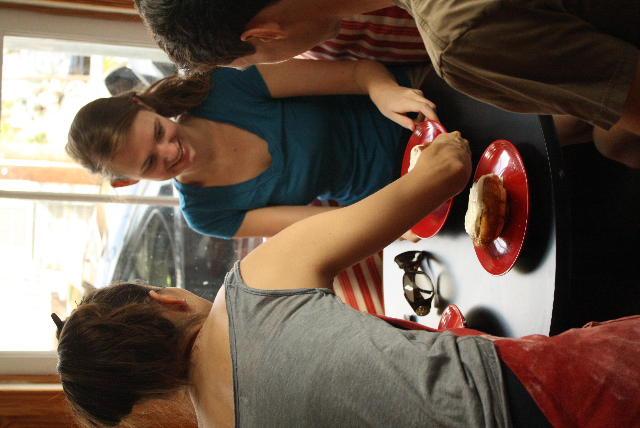 It’s Sticky Bun Sunday at WildFlour Pastry, a weekly tradition just three years old, like the bakery itself, but about as established as any upstart tradition can be in city as steeped in them as is historic old Charleston, South Carolina. The line gradually moves forward each time someone emerges sporting a satisfied smile or toting a to-go box, disappearing on foot or by bicycle or in a car that has been idling nearby or circling the block. Once inside the close quarters of this narrow storefront operation, I find a tiny seating area including a pair of tables wedged into twin alcoves with broad windows facing the street. 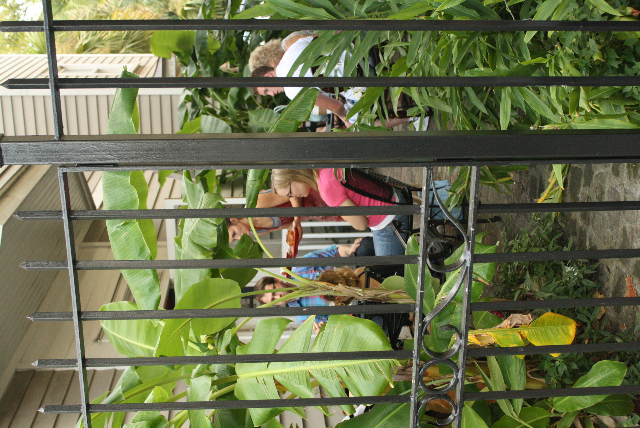 There’s a somewhat roomier courtyard just out a side door with more tables tucked among garden greenery. Finally reaching the service counter at the front of the line, I trade $3 for a red plate bearing a fine specimen of Sticky Bun Sunday’s glorious signature pastry: a WildFlour Sticky Bun. 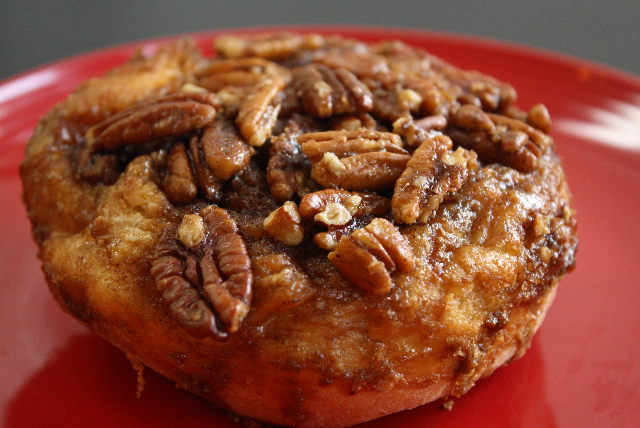 It’s a delightfully gooey (because it’s loaded with butter) sweet roll coated with cinnamon-sugar and topped with about as many pecans as can fit. It’s served warm and with an optional thick blob of creamy white icing on top. Looking around as I eat, I spy a few neatniks approaching this delicacy with a fork and knife, performing a sort of culinary surgery and carving off small bites like they’re savoring fine steaks. 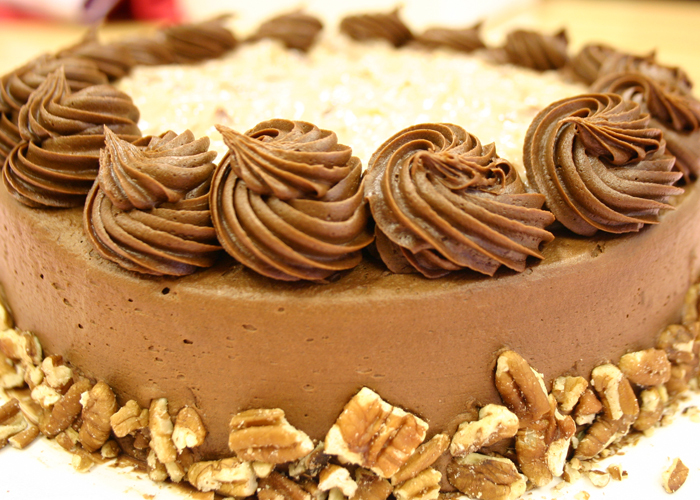 Others, like me, just pick it up and let the sweet ooze drip, happy to lick sticky fingers later. I even see a few quick tongues tidying up sticky plates, messy chins be damned. 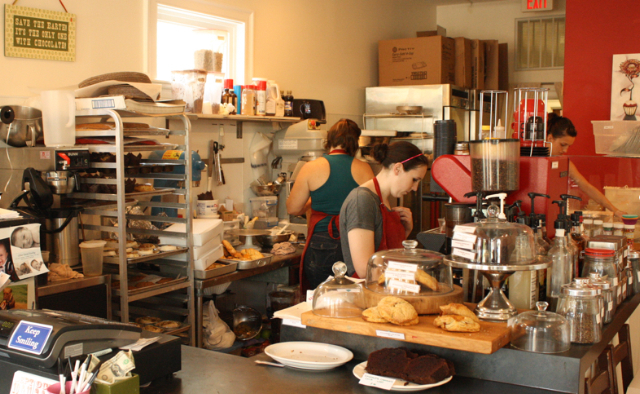 Behind the counter leading her small team of fellow bakers (currently WildFlour has four employees) is owner and sticky-bun queen Lauren Mitterer. A Chicago native and former Seattle-area resident, Lauren went to the University of Virginia on a rowing scholarship (earning a seat on the U.S. Rowing Junior National Team), took a degree in studio arts, and went on to develop her creative bent in the food world, graduating from the Culinary Institute of America in 2004. She has worked as a pasty chef at Tavern on the Green in New York City, Larkspur Restaurant in Vail, Colorado, and Red Drum Gastropub in Mount Pleasant across the Cooper River from Charleston. She’s been nominated twice for awards in the pastry chef category from the prestigious James Beard Foundation, once while working at Red Drum and once at her own WildFlour Pastry. 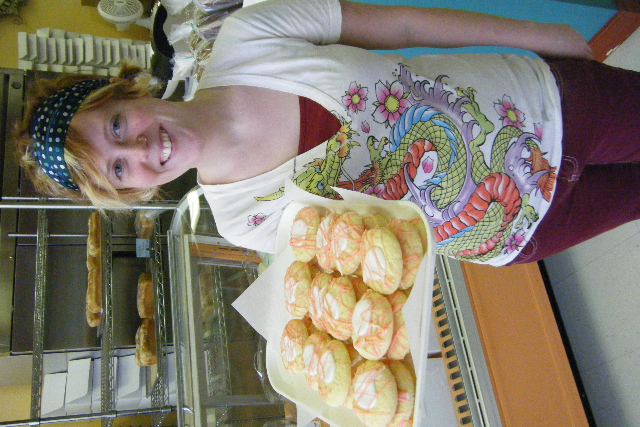 Lauren struck out on her own by opening WildFlour Pastry in September 2009, leasing a 700-square-foot space on the first floor of a petite two-story cottage in Charleston’s Cannonborough/Elliotborough area, a delightful old neighborhood tucked between the city’s bustling King Street commercial district, the Medical University of South Carolina, and The Citadel — The Military College of South Carolina. The walk-in retail side took off quickly enough, but to bolster the operation Lauren also set up a catering business, creating wedding cakes and setting up dessert bars at special events. 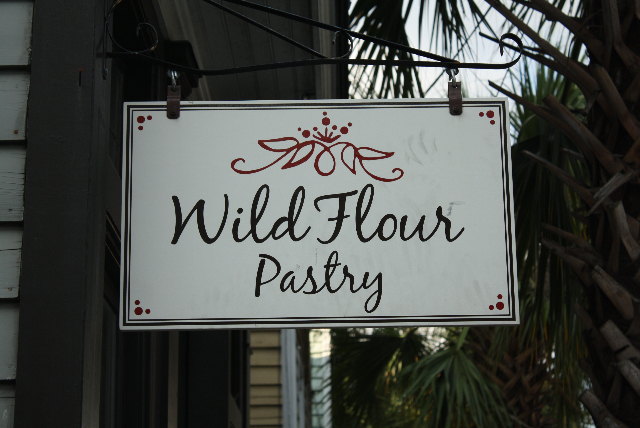 Through WildFlour Pastry she also supplies baked good to such noteworthy Charleston restaurants as The Macintosh nearby on King Street, Next Door in Mount Pleasant, and her former employer Red Drum, also in Mount Pleasant. 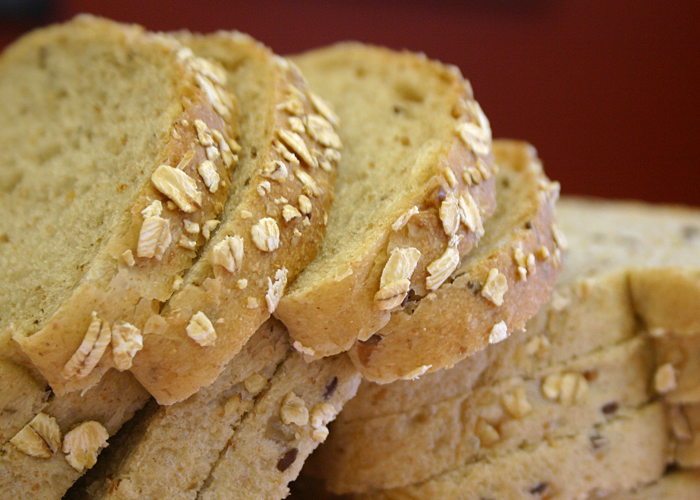 Don’t miss Sticky Bun Sundays from 8 a.m. to 1 p.m. every week at WildFlour Pastry. Bring friends to hang with or something to read in case the wait gets long, but don’t let the prospect of a delay deter you from a popular, worthwhile, tasty experience. 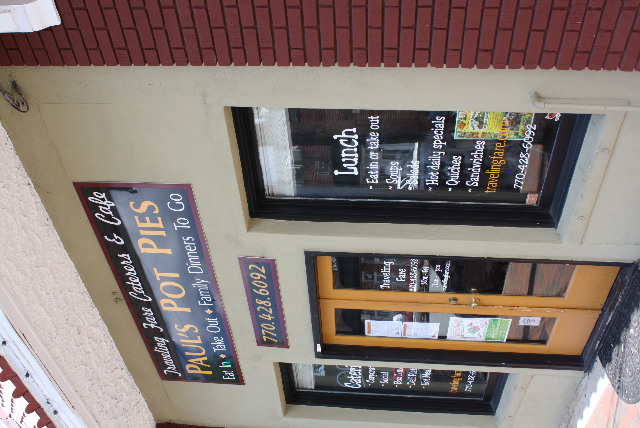 Steaming hot pot pies from Paul Lubertazzi’s Traveling Fare Cafe really hit the spot any time of year. Paul’s Pot Pies from Chef Paul Lubertazzi help keep his Traveling Fare Cafe on the minds of many in Marietta, Georgia, especially when they get hungry. Around lunchtime people in downtown Marietta, Georgia, follow their noses to Chef Paul Lubertazzi’s place just off Marietta Square. For 27 years the amicable owner of Traveling Fare Café & Caterers has been cooking and baking aromatic meals for dine-in or take-out. 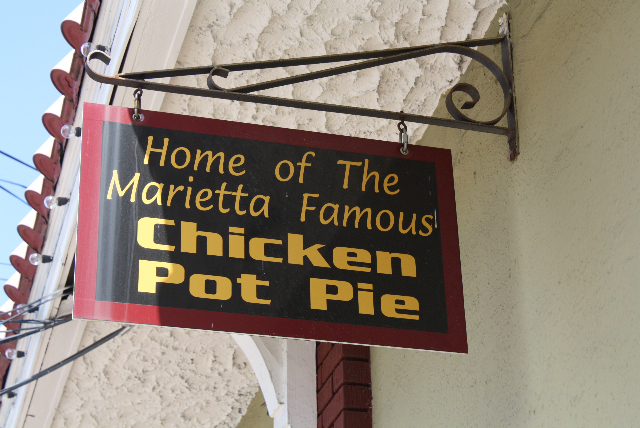 His most alluring creations, called Paul’s Pot Pies, have achieved cult status among a hungry following, and they just might be the best pot pies in Georgia. 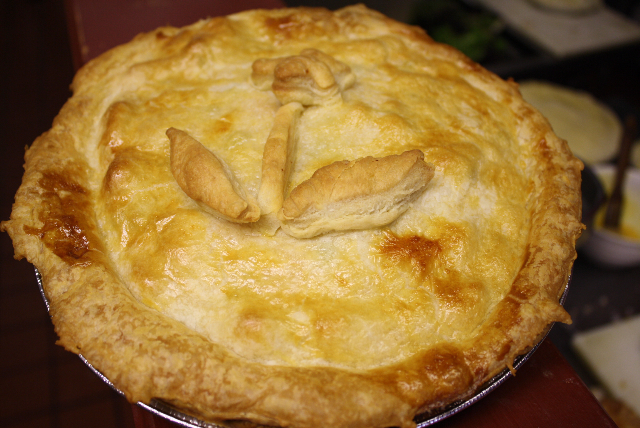 No matter what the weather, hot or cold, a good pot pie is never out of season. 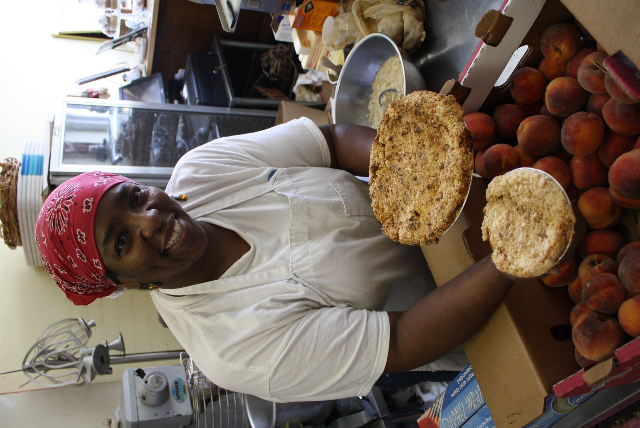 Here’s a primer on a heartwarming comfort food source you should keep on speed dial if you live anywhere close to this city just to the northwest of Atlanta—or if you are willing to pay the extra price to have pies cold-packed for overnight shipping anywhere. 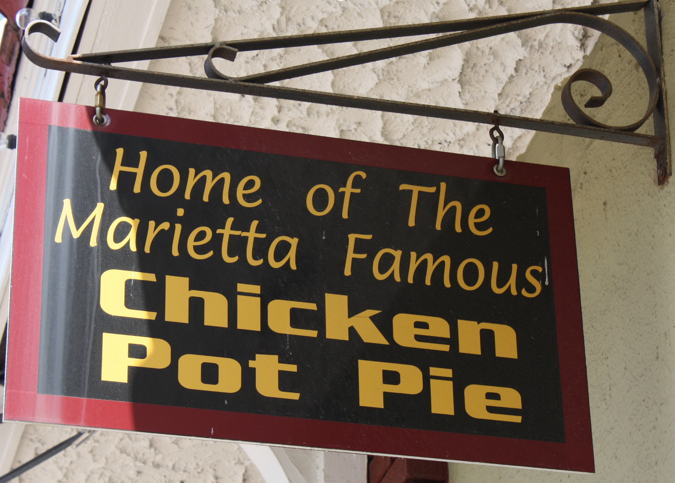 WHAT MAKES THESE POT PIES SPECIAL Fresh ingredients, daily preparation in small batches, reasonable prices ($7.50 for a 6-inch pie to serve one, $21.95 for a 10-inch pie that feeds five or six), and most importantly taste. PAUL’S STORY A New Jersey native and Culinary Institute of America graduate, he cooked in hotel kitchens before launching Traveling Fare Café in 1984. His mother Patricia, wife Roberta, brother Tommy, son Brayden, and daughter Renae help out. INGREDIENTS “I get everything fresh from a butcher and a farmers market—big chunks of chicken or beef and lots of corn, carrots, broccoli, pearl onions, green beans, and peas,” Paul says. A flower shape cut from pastry dough, Paul’s signature, tops each Paul’s Pot Pie. CRUMBLY CRUSTS Paul rolls pie dough bottoms just before filling and baking, so they don’t get soggy waiting. 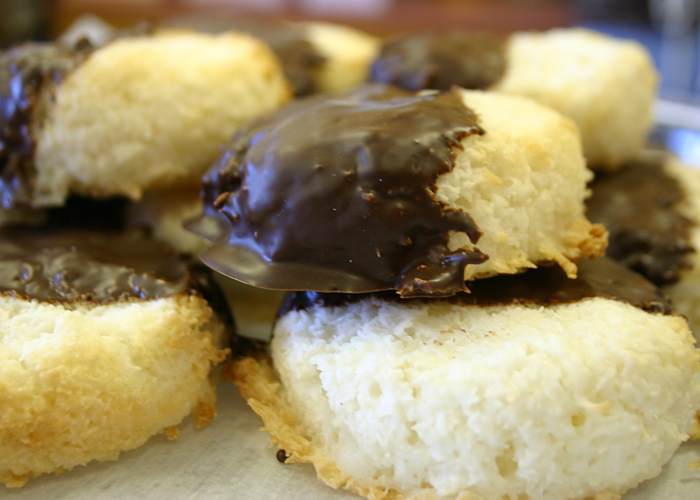 He uses puff pastry for the tops for a crisp look and buttery taste. VARIETY COUNTS Paul makes at least eight different kinds of pot pies. A few examples and what’s in them: Chicken Pot Pie (white meat, peas, potatoes, carrots, corn); Pot Roast Pot Pie (eye round, potatoes, onions, carrots, peas); Vegetarian Pot Pie (feta cheese, cannelloni beans, spinach, broccoli, carrots, zucchini); Italian Sausage Pot Pie (sausage, mozzarella, provolone, onions, zucchini, bell peppers, marinara); Creole Shrimp Pot Pie (shrimp, rice, tomatoes, onions, bell peppers); Pizza Pot Pie (ground beef, mozzarella, provolone, onions, bell peppers). 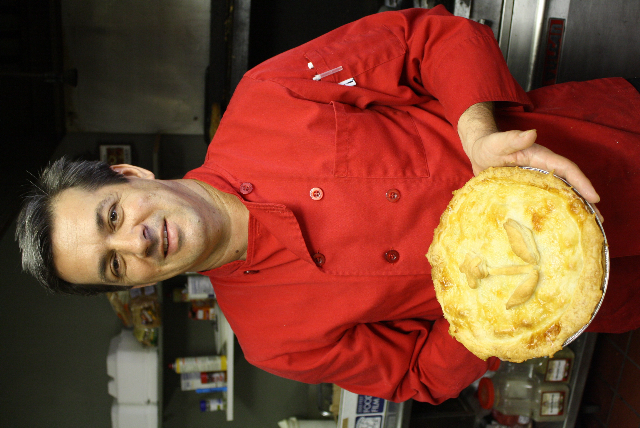 Look for Paul's Pot Pies at Traveling Fare just off Marietta Square downtown. GIFTING PIES Show up with pot pies at any sort of party—housewarming, birthday, football—or when visiting new babies or sick friends. They’re sure to be hits. Treat yourself sometime when you just don’t feel like cooking. TIPS Order ahead to avoid hearing the dreaded words, “They’re all gone!” Eat there at one of four small tables, or get a hot pie for take-out, or carry one home to freeze for later (cooking instructions provided). 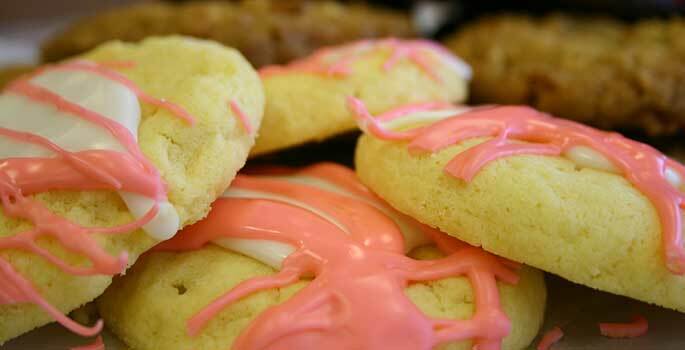 Thumbprint Cookies. Photo by Andrew Hock. 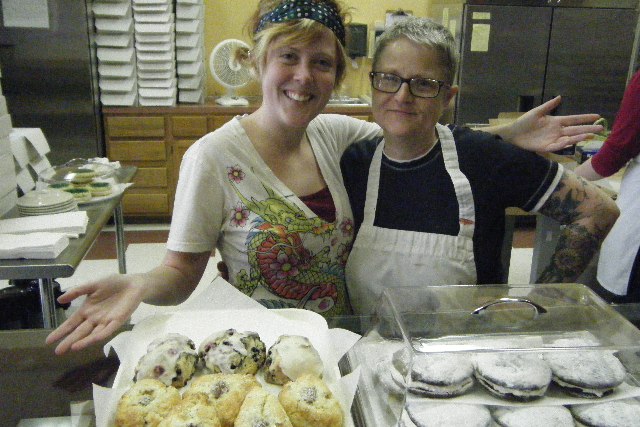 Everything made from scratch and no compromising on quality are the twin mantras practiced at this excellent bakery west of Knoxville. 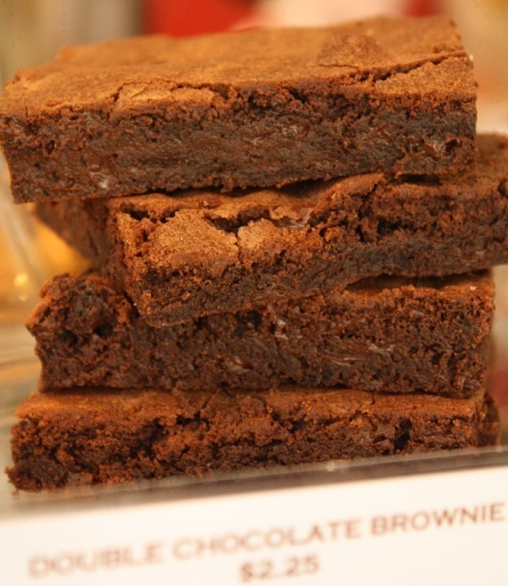 “Fresh ingredients are the key to baking from scratch,” says David Gwin. 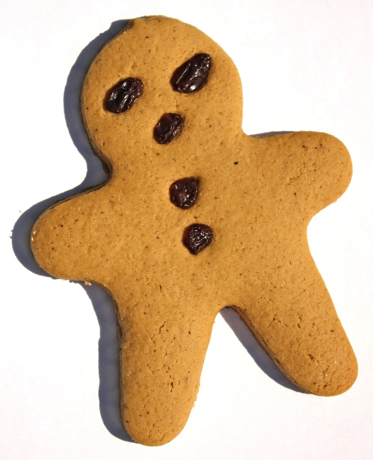 Photo by Bakery Boy. 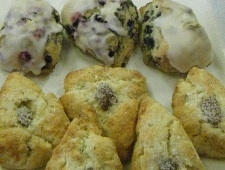 Just when you think you know thumbprint cookies, along comes VG’s Bakery to change your whole perspective on the matter. 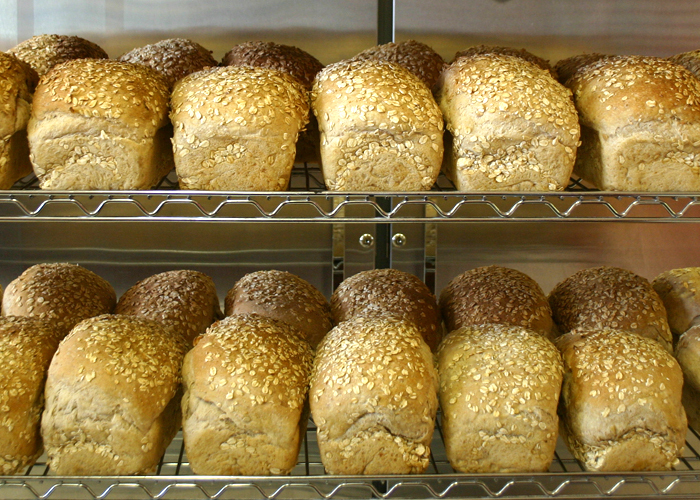 “We make ours four inches in diameter and thicker than most, then load them with icing,” says co-owner David Gwin. 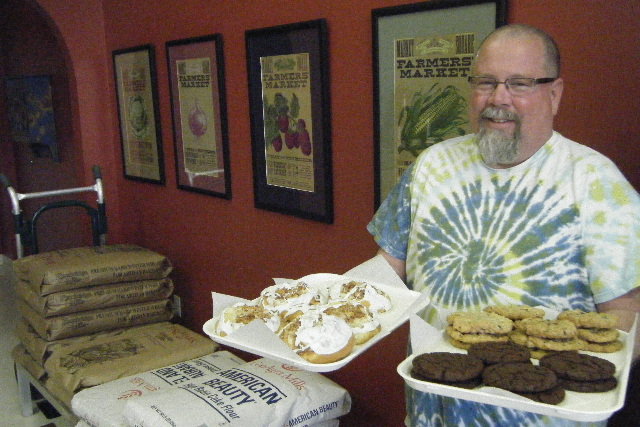 “Nobody has a thumb that big, but we call them Thumbprints anyway.” They sell for $1.25 each or $12 for a baker’s dozen. Yes, even as giant as they are and with a discount for buying in volume, VG’s throws in an extra cookie to sweeten the deal. How nice is that? Katie Gwin (left) and her mother Vanessa Gwin. Photo by Bakery Boy. Katie with more Thumbprints. Photo by Bakery Boy. A salvaged jewelry case adds a special touch. 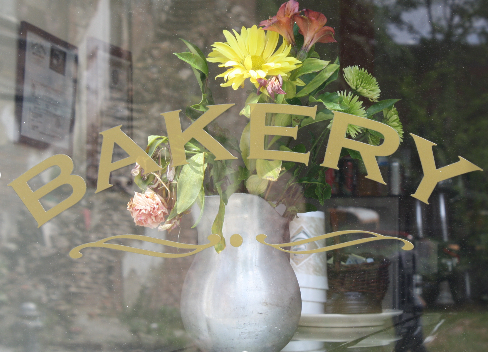 Photo by Bakery Boy. 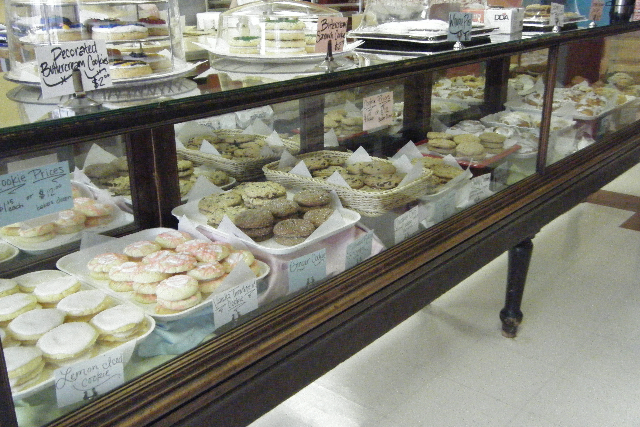 LOCATION VG’s Bakery, 11552 Kingston Pike, Farragut, TN 37934. Just west of Knoxville take I-40/75 Exit 373, go south on Campbell Station Road, then west on Kingston Pike to a shopping center on the left anchored by Kohl’s department store. VG’s is squeezed between an H&R Block tax preparation service and a Bahia Tans tanning salon. 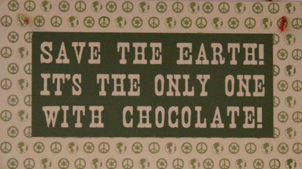 HOURS Monday-Friday 10 a.m.-6 p.m., Saturday 8 a.m.-3 p.m.